game at the Blue Water Festival Hinkauea Beach party. 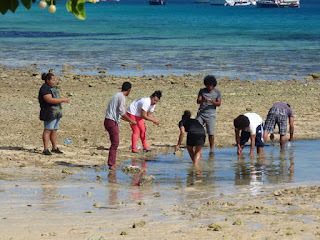 We arrived in time for Tonga’s New Zealand-sponsored Blue Water Festival. We didn’t know about it ahead of time or plan to participate in it. Ultimately, though, we couldn’t resist its mix of New Zealand-focused weather-passage planning info, New Zealand entry, marina and cruising info, cultural events and parties. Weather guru and All Points Rally guy, John Martin’s presentation on when and how to make the 1,000+ mile jump from Tonga to New Zealand was particularly helpful. “You don’t need that long a weather window when you stop at Minerva Reef,” he advises. That cuts the passage into two weather windows, one that’s a few days our slow boat, ~375 miles from Tonga . It’s followed by the next weather window, about 735 miles, about a week for us. his arm was even better than his smile. “Don’t be tempted to stay for Big Mama’s parties [in Tongatapu, Tonga] and leave late! She may tell you waiting for the next weather window is fine. Great lady. She knows nothing about weather though”, he warned. As well, he strongly advised not aiming directly from Minerva Reef for Opua New Zealand. Instead he suggests cruisers buffer their passage with lots of extra Westing, and aim for North Cape New Zealand, and then shift to Opua if it looks do-able when close. to show up at the party. John’s a big fan of PredictWind Offshore, a cruising trip planner which uses state-of-the-art marine weather forecasting to provide graphical customized routing recommendations. Real-time updates are factored in based on data accessed through traditional wifi or Iridium satellite. John not only offered anyone interested coaching on how to use PredictWind Offshore even updated my satellite wifi hotspot Iridium Go to the latest firmware from his thumb drive. making pole dancing moves with their torches while setting up. Helen, a New Zealand customs inspector gave a helpful overview and Q&A regarding what does and doesn’t need to be declared on foodstuffs and other animal, vegetable and dairy matter. Along those lines, she covered what’s most likely to be confiscated. In short (my interpretation): If in doubt, declare. If it’s in tin (commercially packaged), it’s probably in. If it’s likely to sprout, it’s probably out. If it’s buggy, expect confiscation. Ditto any kind of egg – even powdered – and any fresh produce. New Zealand marina and marine facilities were covered, too. 84 Seagull restaurant made a killer breakfast for one presentation, including the best cinnamon rolls I’ve eaten in years. Aquarium café served decent New York pizza for an evening presentation. Tropicana hosted in other ways, as the go-to place for Blue Water Festival info and materials, and providing personnel for events as needed. Tropicana’s the best available wifi in Vava’u, Tonga (6 TOP [~$3 USD]/hour/device) and an exceptionally good cup of Tongan-made coffee (and also sells the coffee beans for $17TOP/kilo [~2.2 lbs.]). was both beautiful and graceful. We skipped the rallies, pub crawls and masquerade parties. 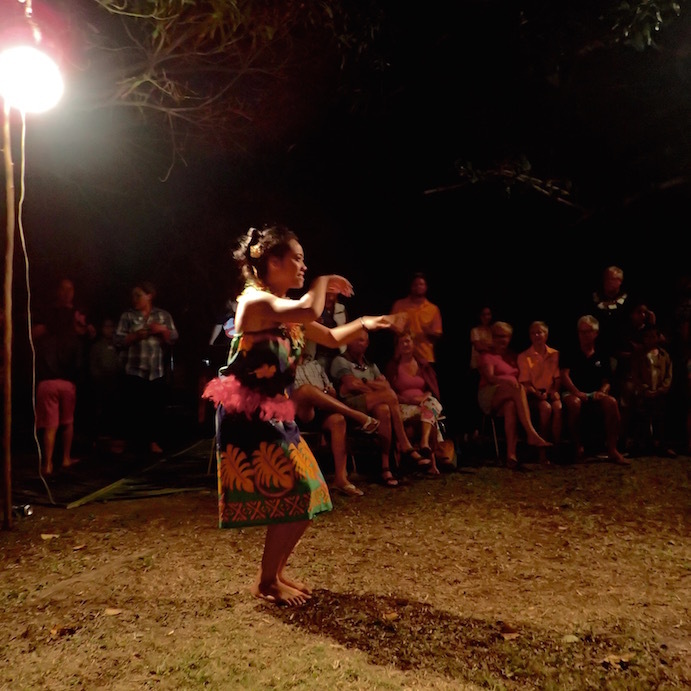 The Tiny Tonga dancers were a hoot (click here to see photos). Ozzie ex-pats Ian and Vanessa of Taste of Tonga gave a great presentation and tour of their zero waste virgin coconut and vanilla bean export production operation. Watch for more on that in a future post. 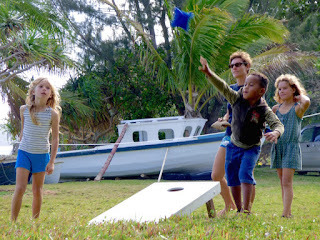 At the Hinkauea Beach party, we learned how to play corn hole. 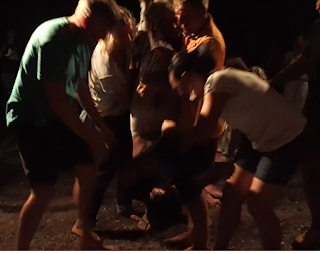 We played it on the grass, as Hinkauea Beach isn’t really very beach-y at all. DJ Q played some great dance music and with his wife did a splendid “Master of Ceremonies” job. We took 2nd place in their “Newlywed Game” and got a kick out of watching the winner of the male dance contest get pantsed afterward. The Curry House curry was well worth the few bucks we paid to give it a try; meal proceeds went to local charity. Yow! Don’t know how those flame eaters do it! Another Hinakauea Beach Blue Water Festival event. 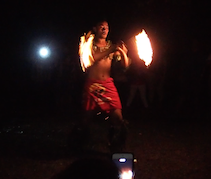 We even finally got to see live Tongan fire dancing. 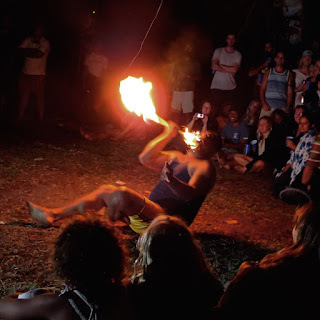 Fire dancing was promised but not delivered at several other French Polynesian venues. The wait was worth it! We realize a ton of work went into making the Blue Water Festival happen. We especially appreciate that the New Zealanders were as keen on highlighting Tonga culture, businesses and supporting local charities as they were welcoming us to New Zealand. Thanks, all! 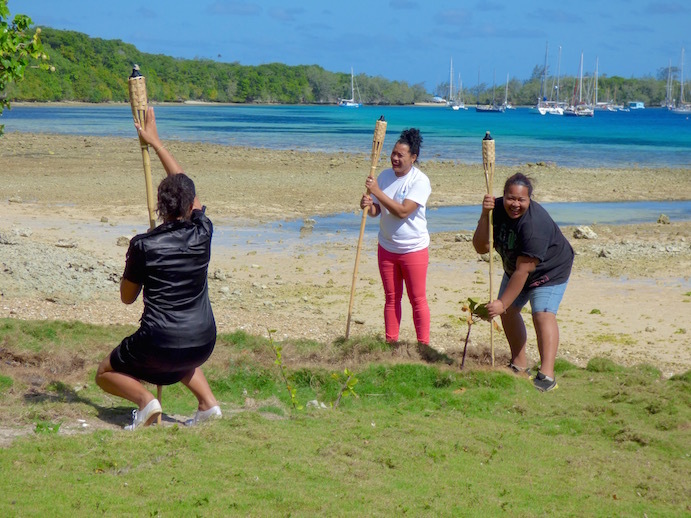 You gave us some of the best exposure to Tongan culture during our stay, and whet our appetite for what’s in store next, cruising and traveling in New Zealand. performance, after getting more regular wifi in New Zealand. 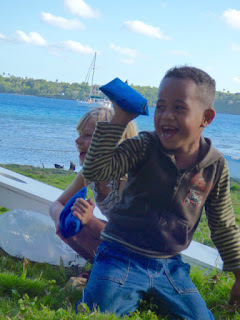 This post was finalized and posted in Neiafu, TONGA (S18.39.443 W173.58.965). We are now inTonga's Ha'apai group of islands (lat/long to be updated). We will be mostly out of wifi range between now and until we arrive in New Zealand in mid-November. There will be catch-up posts to fill in when wifi is available.